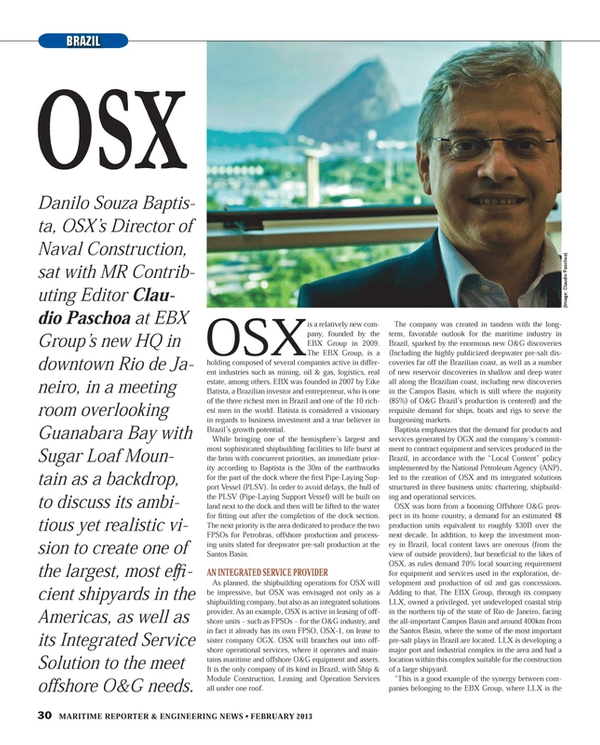 Danilo Souza Baptista, OSX’s Director of Naval Construction, sat with MR Contributing Editor Claudio Paschoa at EBX Group’s new HQ in downtown Rio de Janeiro, in a meeting room overlooking Guanabara Bay with Sugar Loaf Mountain as a backdrop, to discuss its ambitious yet realistic vision to create one of the largest, most efficient shipyards in the Americas, as well as its Integrated Service Solution to the meet offshore O&G needs. OSX is a relatively new company, founded by the EBX Group in 2009. The EBX Group, is a holding composed of several companies active in different industries such as mining, oil & gas, logistics, real estate, among others. EBX was founded in 2007 by Eike Batista, a Brazilian investor and entrepreneur, who is one of the three richest men in Brazil and one of the 10 richest men in the world. Batista is considered a visionary in regards to business investment and a true believer in Brazil’s growth potential. While bringing one of the hemisphere’s largest and most sophisticated shipbuilding facilities to life burst at the brim with concurrent priorities, an immediate priority according to Baptista is the 30m of the earthworks for the part of the dock where the first Pipe-Laying Support Vessel (PLSV). In order to avoid delays, the hull of the PLSV (Pipe-Laying Support Vessel) will be built on land next to the dock and then will be lifted to the water for fitting out after the completion of the dock section. The next priority is the area dedicated to produce the two FPSOs for Petrobras, offshore production and processing units slated for deepwater pre-salt production at the Santos Basin. As planned, the shipbuilding operations for OSX will be impressive, but OSX was envisaged not only as a shipbuilding company, but also as an integrated solutions provider. As an example, OSX is active in leasing of offshore units – such as FPSOs – for the O&G industry, and in fact it already has its own FPSO, OSX-1, on lease to sister company OGX. OSX will branches out into offshore operational services, where it operates and maintains maritime and offshore O&G equipment and assets. It is the only company of its kind in Brazil, with Ship & Module Construction, Leasing and Operation Services all under one roof. The company was created in tandem with the long-term, favorable outlook for the maritime industry in Brazil, sparked by the enormous new O&G discoveries (Including the highly publicized deepwater pre-salt discoveries far off the Brazilian coast, as well as a number of new reservoir discoveries in shallow and deep water all along the Brazilian coast, including new discoveries in the Campos Basin, which is still where the majority (85%) of O&G Brazil’s production is centered) and the requisite demand for ships, boats and rigs to serve the burgeoning markets. Baptista emphasizes that the demand for products and services generated by OGX and the company’s commitment to contract equipment and services produced in the Brazil, in accordance with the “Local Content” policy implemented by the National Petroleum Agency (ANP), led to the creation of OSX and its integrated solutions structured in three business units: chartering, shipbuilding and operational services. OSX was born from a booming Offshore O&G prospect in its home country, a demand for an estimated 48 production units equivalent to roughly $30B over the next decade. In addition, to keep the investment money in Brazil, local content laws are onerous (from the view of outside providers), but beneficial to the likes of OSX, as rules demand 70% local sourcing requirement for equipment and services used in the exploration, development and production of oil and gas concessions. Adding to that, The EBX Group, through its company LLX, owned a privileged, yet undeveloped coastal strip in the northern tip of the state of Rio de Janeiro, facing the all-important Campos Basin and around 400km from the Santos Basin, where the some of the most important pre-salt plays in Brazil are located. LLX is developing a major port and industrial complex in the area and had a location within this complex suitable for the construction of a large shipyard. “This is a good example of the synergy between companies belonging to the EBX Group, where LLX is the landlord and we, OSX, rent out the area for our shipyard, it will be the biggest shipyard in the Americas,” said Baptista. While it is the aim to keep investment in Brazil, it was quickly realized that the task to build large, efficient shipbuilding construction facilities would be aided greatly through partnership with acknowledged world leaders. Hence Açu, where the OSX is currently building its formidable shipyard, boats a strategic partnership with Hyundai Heavy Industries (HHI), widely considered to be one of the most efficient large shipbuilding outfits in the world. The relationship includes the transfer of state-of-the-art technology and HHIs’s highly efficient shipbuilding methods, the vital “know-how” to give the fledgling yard a much needed headstart toward producing high quality end products and consistently meet specified construction deadlines. The OSX Açu UCN (Naval Construction Unit), will be located within the Superporto do Açu (Açu Superport) in municipality of São João da Barra. The competitive advantages brought about by this integration with other EBX Group projects in the region weighed strongly in the final decision to locate the UCN in the Açu Superport area, especially assets such as the private port terminal, the steel plants and a thermal energy plant. Covering over 3 million sq. m., the Açu UCN will be serviced by a 2,400m (7,874 ft) pier, expandable to 3,525m (11,565 ft), and a man-made internal navigation channel. Around 4,000 direct jobs will be created during the construction phase, while the construction site is currently employing more than 2,500 workers and around 10,000 direct jobs will be created for the operation of the shipyard. The yard will have Goliath cranes, capable of lifting up to 1,600 tons and at least one “Supercrane” with a 5,000 thousand ton lifting capacity. In full operation, which OSX expects to reach by 2014, the shipyard will be capable of simultaneously integrating up to 11 FPSOs and 8 WHPs (Wellhead Platforms). It will have a massive steel processing capacity of 180,000 tons/year, expandable to 400,000 tons/year. When asked about being awarded contracts for two FPSOs by Petrobras, Baptista explained that OSX and venture partner and major Brazilian construction company Mendes Júnior have entered into an agreement with a pool of companies formed by Petrobras, BG Group, and Petrogal Brasil, through its subsidiary company Tupi BV, for the construction and integration of topside facilities for platforms that will operate in the pre-salt plays at the Santos Basin. The project includes construction of module units (Package I) as well as integration of two “replicant” FPSOs: P-67 and P-70. The project is expected to create approximately 3,000 direct jobs and last 60 months. Executive engineering work has already begun and construction of the modules in Package I for the two platforms is also scheduled to begin in the first quarter of 2013. These FPSOs are called ‘replicant’ because of their standard design and common construction strategy. Each FPSO will have capacity to process up to 150,000 boe per day and to compress 6 million cu. m. of gas. The agreement covers complete design, supply, construction and assembly of eight production units in Package I. It also includes assembly and integration of 10 units built by other companies for the hulls of FPSOs P-67 and P-70, besides commissioning and start-up until the first barrel of oil is extracted. As you can see, the OSXs Açu UCN will begin operations in style and there is no doubt that they are under tremendous pressure to deliver. The Açu UCN, which is the official name of the OSX shipyard, represents a total investment of $1.7B. OSX obtained approval from the executive board of the Merchant Marine Fund for a funding line of up to $1.35B and a 10-year grace period to build up UCN Açu. In January 2012, the company received $227.9m under a bridge loan from the National Development Bank (BNDES) for this purpose. OSXs construction focus is on high aggregated value ships and rigs, such as FPSOs, WHPs, Drillships and Large Support Vessels, like PLSVs, AHTSs and RSVs. Once the Açu Superport goes operational, OSX will be able to decrease its operational costs by use of thermal energy and use of larger steel sheets produced by its neighbors at the Açu Superport, this will also significantly reduce steel transport costs. While the Brazilian business is booming, it is saddled with many of the same problems that vex shipbuilders globally, specifically the challenge to find, train and retain an efficient and technically qualified workforce. Particularly acute in Brazil is the fact that the major shipbuilding industry in country has been largely dormant since the early 1970s. Baptista said to partially solve the problem, OSX now has opened an operational technical institute, working under the auspices of Senai, Brazil’s foremost technical training institution. In this first phase there will be 23 courses and 3,100 potential workers will be trained by 2013. Of these 3,100, 1,000 have already been hired to work at the shipyard. This is OSX’s training institute, ITN – the Institute of Naval Technology. Aimed at promoting research and development, projects, and sponsoring initiatives focused on technological development and innovation, OSX created the ITN – Institute of Naval Technology will be developed in four phases. In the first phase, ITN is training professionals in careers required to make up the teams that will work in the Açu Shipyard and OSX Serviços. Under a contract with the Rio de Janeiro Industrial Federation, Firjan, facilitated by Senai-RJ, the Program for Professional Qualification in Shipbuilding was created to train the initial 3,100 professionals by 2013. The initiative is ITN´s first partnership and will invest approximately $6.5m to qualify professionals for the project. Baptista said he and all at OSX were amazed when they saw that over 19,000 candidates from Campos dos Goytacazes, São João da Barra, and other neighboring cities applied for the Program for Professional Qualification in Shipbuilding. The selection process was held in three stages. The courses are free of charge, and selected candidates receive a grant for living expenses. Courses are offered free of charge include: Metal-Mechanics, Electricity, Metallurgy, Automation/Tooling, Oil & Gas, Automotive Operations, Civil Construction, and Management. Another interesting fact is that, of the 14,000 candidates approved, nearly 50 percent are women. The first 21 classes, distributed among nine different courses, began on June 25. Baptista has a degree in Mechanical Engineering from the Federal University of Rio de Janeiro and has a specialization degree in Equipment and Maintenance Engineering and Managerial development by the University of São Paulo. He began his career in 1978 as an Equipment Engineer at Petrobras where he worked for 33 years in the engineering and international areas of the company. Within the scope of his international experience, he performed roles related to project implementation in South Korea where he spent three years at Hyundai´s shipyard. Baptista also worked in China, the U.S. and France. In October of 2010, Baptista joined OSX as Integration Executive Manager after retiring from Petrobras. Since August 2011, he has been OSX´s Shipyard Executive Manager where he has been responsible for all activities related to the construction of the shipyard. Currently he occupies the position of Shipyard Operations Officer.